There’s a reason we encourage companies to invest in our work at height safety and ladder training courses – and today we’d like to show you a shocking example of why it’s so important. This Health and Safety Executive (HSE) case is one of countless examples of falls from ladders that result in injuries and companies having to shell out thousands of pounds when, in reality, they could have been easily avoided. The Chesham-based company was fined £5,950 and ordered to pay £10,000 in costs after admitting breaching Work at Height Regulations. The 44-year-old employee broke his arm and lost several teeth after falling from a ladder at work. He was fixing bunting outside a supermarket for the celebration of the Duke and Duchess of Cambridge at the time. He and a colleague were using a ladder for the job when he slipped, and fell five metres to the ground below. An investigation by the Health and Safety Executive (HSE) found the company director actually advised the use of ladder even though even though two other nearby workers were using safer equipment. Therefore, it was unnecessary to use a ladder when there was safer access equipment available. 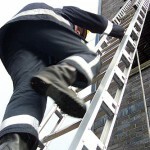 Falls from ladders account for an average of 14 deaths per year (averaged over 6 years). According to HSE statistics, falls from ladders account for almost a third of all injuries and cost the UK economy £60 million every year, as well as being the number one cause of workplaces deaths. It’s not just employees claiming money that should motivate you – how would you feel if an untrained employee died or was seriously injured falling from a ladder? Accidents involving ladders are too common and most businesses have at least one ladder. Although it’s likely that you only need to use ladders for short periods, you must, nonetheless, ensure the length of time employees are up there is as safe as possible. And this is at the heart of the matter – why ladder training is so important. You MUST get the relevant knowledge and understanding to make sure you feel competent so you can carry out the job and finish it without consequences.